As you can probably tell from my posts about fitness, I aim for a healthy lifestyle as much as possible. Obviously I still have carbs and sugar and booze and whatnot because I’m not, y’know, dead but I do aim for the healthy choice when I can. And then I think Nah, jeez, can’t be arsed and ring up for a pizza instead. Once I get those days down to less than 6 out of 7 then I will really have this healthy eating business licked. Meal box delivery services are designed for people like me who have good intentions, but are ultimately quite busy, and lazy to boot. There are a lot of us about, hence the proliferation of these services in recent years. There’s a social enterprise element, in that some of the proceeds from the recipe kit sales fund community healthy eating programmes for families and young people on low incomes. Make Kit does this through free cooking classes in partnership with local schools, youth clubs and children’s centres. I love that they do this. 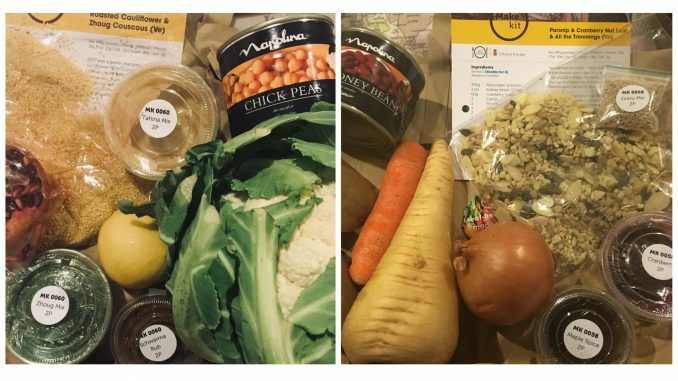 Customers build their own weekly meal plan consisting of two or three meals, and orders are delivered to your door. You get recipe cards and all the necessary fresh and dried ingredients. There’s a choice from a menu of six meals which changes weekly. Delivery is on a Tuesday. My delivery turned up quite early in the day, before 10am. So you need to either be at home or have a space to store it because the box contents are going to need to go in the fridge pretty sharpish. 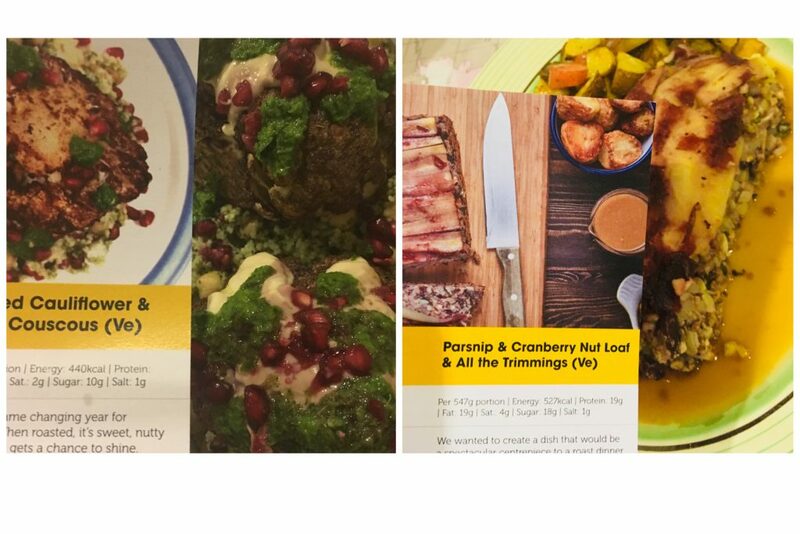 When I agreed to review Make Kit Food I was simply told that I’d receive two meals, with two portions each. I didn’t know what was actually coming until the box turned up. Zhoug was a new one on me, but I watch a lot of sci fi so I’m not phased by names with Z in them. Turns out it’s a Middle Eastern spicy paste which originated in Yemeni cuisine. Bloody nice on cauliflower too. All of the spice mixes come pre-measured out, but you still have to do a bit of prep in the form of chopping veg etc. You’ll also have to have a bit of oil and salt etc to hand. Both meals were really, really delicious. Portions were big enough for there to be a bit left over for the next day’s lunch. As you can see, they don’t look a million miles from the pictures on the enclosed recipe cards so the process definitely works. Prep takes around 20 to 30 minutes. I found the meals fairly easy to make, and the enclosed instructions are clear and well thought out. I don’t recommend trying to cook more than one recipe at once though. And if you are cooking two of them, don’t try and update your Instagram story at the same time. This was my downfall. By the end, the kitchen looked like a helicopter had flown through it. 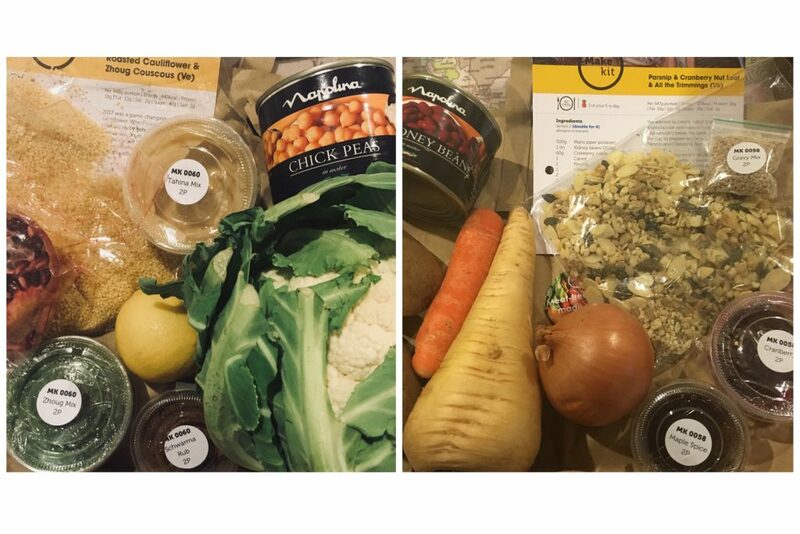 As a (mostly) veggie household, this box was right up our street. Where I can also see this service proving useful is if you have a vegetarian or vegan coming to stay and you can’t think of what to cook them. One of these kits will sort you right out. One thing I would say is that these are quite grown up meals, so if you have someone in your house with a plain palate, they might struggle. I couldn’t interest the kids in them, though to be fair I didn’t try very hard because I wanted them all for meeeee (and Himself). And I can see that this week’s menu choices include Veggie Spag Bol, so it’s not all exotic all the time. All in all I thought the quality was excellent and the price fair, especially when you factor in the social enterprise element. I’ve been vegetarian for long enough to remember when people’s idea of preparing a vegetarian meal was by picking the ham off a pizza. What a long way we’ve come. Make Kit is available at www.MakeKitFood.com Deliveries take place to all UK mainland postal addresses every Tuesday. There are various options depending on how many meals and portions you want. The minimum order of two meals of two portions each (as shown here) costs £23.80 (£5.90 per portion). Maximum order is 3 meals of 4 portions each, which works out at £50 (£4.20 per portion).